tderz: I am quite sure that this stuff is already placed somewhere on Senseis. Still I add this diagram: a is best, b is possible, c and d are mistakes. tderz if now Wa, than Bb is best. tderz is tesuji, allowing for connection Wa or capture Wb. unkx80: How is this result bad for Black? The stones are wasted and the corner White group has only 1.5 eyes. 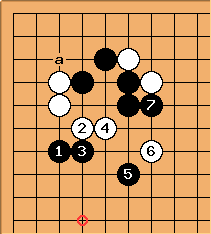 tderz: unkx80, I agree with you about the little aji (white t) of the stones and the eyes and share youre opinion of the possibility of this counterattack. As with all Josekis it's perhaps best to compare it in game context, i.e. consider why White moved in there at all. 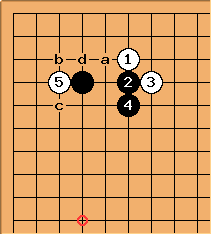 IMO, it's purely to stir up some confusion, in contrast to the well-known 3-3 invasion or the other 3-4 attachment. All these diagrams here still have a teaching value, i.e. demonstrating the value of a in diagram . tderz: is the similar technique as in Takemiya's sanrensei. How can W continue? unkx80: Wait a minute. Whose turn is it? unkx80: Where is ? When you have finished reading this, just delete the whole thing. Or let me know what my mistake is? 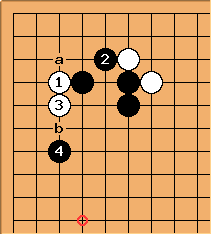 fractic: In the second diagram tderz suggested that whould be played after at a. Tenuki with looks odd to me and I think a or b is better for black then after a tenuki. tderz: White a (or also b?) can now be considered. I would like to compare this diagram with diagram . The advantage here is really that White is confined nicely to the corner and not running wild into the center. Often there are Black stones around and White's initial idea was to deal with a developing moyo. If white a, the a descend x threatens life-endangering y, hence similar to diagram . as then a white t cannot be atari (and threatening ponuki). Anyway, I play this only in handicap games. 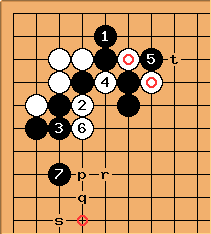 tderz: ... therefore let's assume that is played for a normal & quite understandable connection between the initial kakari and here. Everything else what I said still holds and expresses the view I wanted to convey. (I guess I wrote my first entry after having returned from China, resp. 10 hours flight or 24-40 hours few sleep. Sorry for that. 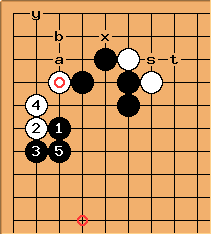 although there might be also good arguments for the hane c .
tderz: However, often or in most cases, White wants to connect first at d.
tderz is tesuji, allowing for connection Wa or capture by Wb. tderz: Here, W didn't connect at m+ . 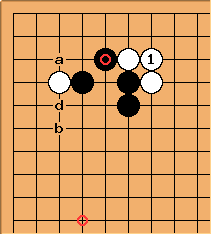 Still is tesuji, allowing for connection Wa or capture Wb. Please notice that this is a transponded(?) 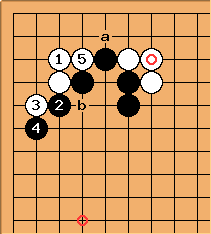 formation of below, which is commented on in Ishida, vol. 3, p. 131, dia. 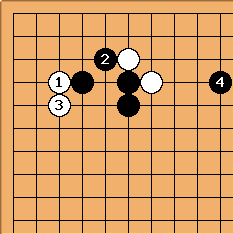 49: Letting White connect is awful. tderz: is the similar technique as above. tderz: this is a poss. further continuation (Ishida, vol. 3, p. 132, dia. 54. Please notice, how nicely - - induce , a point which Black likes to take anyway. tderz: this is another option (source: Chin. 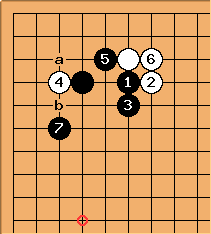 Joseki book, 1985; translated from Jap. ), concentarting more on the upper right side.